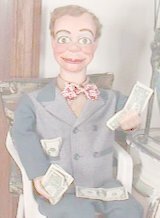 Ventriloquist Marketplace "Buy, Sell, Trade" is only a listing service to allow anyone to offer, sell, buy, or trade ventriloquial items. We are not involved in the actual transaction between buyers and sellers. We have no control over and do not guarantee the quality, safety or legality of items listed, the truth or accuracy of listings, the ability of sellers to sell items, the ability of buyers to pay for items, or that a buyer or seller will actually complete a transaction. Listing with us is easy. Decide what item (or items) you want to sell or trade. Click on the pay button for your item. Send your pictures to: ventdog@gmail.com.